A few weeks ago I returned back from AngularConnect conference in London. I had the pleasure of speaking about my experience of building a genome viewer for Genome Compiler using both AngularJS and SVG. In this article, I will show you a small use case of how to create a visualization of some biology data using AngularJS. While I won’t show you how I created Genome Compiler genome viewer, you will get a taste of how you can create your own visualization. The article will explain how to read a biology formatted file using HTML5 File API, how to use AngularPlasmid library to create a simple visualization and how to build the application using AngularJS. Disclaimer: this article assumes that you have AngularJS knowledge and won’t cover the framework building blocks. 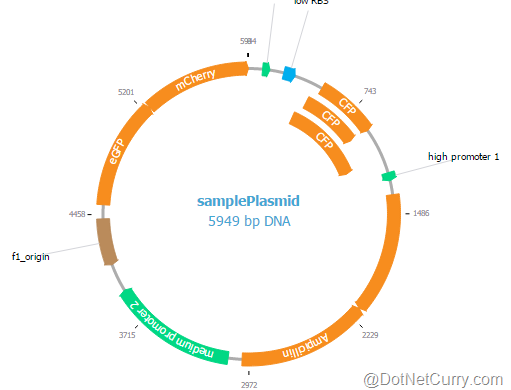 Before I start to explain how the application works and how I created it, you will need a small ramp up about some biology concepts that we will use in the application: the FASTA format and plasmids. As you can see, the description line (first line) starts with a greater-than (>) symbol which is part of the format. The greater-than symbol might be followed by an identifier and after the identifier there will be a description. Both the identifier and description are optional. In the example above, there is only a description. In the application that we are going to create, we will receive a FASTA file as an input, which we will read and parse. In the previous section, we already created the FASTA format parser and in this section you will learn how to read a file using the HTML5 File API. The HTML5 File API includes a small set of objects that enables you to read files. That doesn’t mean that you can just create file readers and read the entire user file system. Browsers restrict the option to read file for security reasons so you will need the user to interact with the application and explicitly allow you to read specific files. You have two points of interactions: drag and drop or file input types. Each of those options will enable you to get a pointer to a file/s to be able to read it. As you can see in the snippet, in the file input type, I use a file-reader attribute which indicates that I have created an AngularJS directive which I’ll explain later on. I also use a second attribute that is called fasta-content which is going to be a model holder in the application. Once the file is read, the fastaFileContent will hold the FASTA file content and we will be able to parse it. 1. readAsText – reads the file as string. 2. readAsDataURL – reads the file and returns a URL representing the file's data. 3. readAsBinaryString – reads the file and returns raw binary data representing the file content. 4. readAsArrayBuffer – reads the file and returns an ArrayBuffer that represents the file’s content. The FileReader reads the file asynchronously and therefore includes some event handlers such as onerror, onload or onloadstart. Once the file was read, the file’s content will be stored in the FileReader result property. The directive wires an event handler to the file input type change event. When we get a new file, we validate it is a FASTA file and then use a service to read the file content and put it in the fastaContent scope variable. The code of the service is straight forward. Since the FileReader API is asynchronous, we will use a promise to wrap the code. The promise is created using the AngularJS $q service and is resolved only when the FileReader finished the reading of the file. Note: If you don’t know what promises are, I suggest reading “Using Promises in Node.js Applications” article to get some information about the subject. Note: You can explore the entire AngularPlasmid API in the library’s web site at: http://angularplasmid.vixis.com/api.php. The interesting function in the directive is the draw() function. 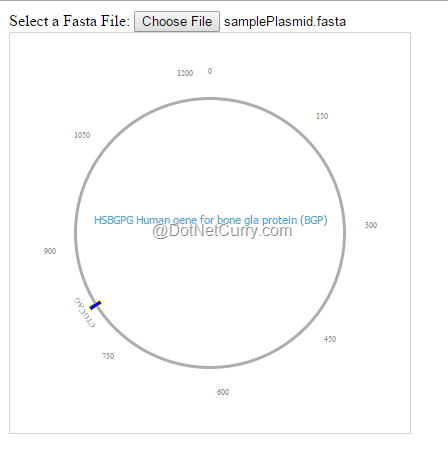 In the draw function, I append the plasmid I generate using the given data to the directive’s element. 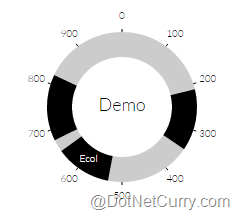 Then, I compile the element content and attach to it the directive scope. That will do the magic and create the data binding for us. Now that we know how to generate a plasmid representation, it is time to combine all the things that we learned so far and create a whole application based around it. In the controller, we watch the fastaFileContent property. The property will only change when the file is read by the file-reader directive change function. Once the content changes, we parse it and raise the data:ready event to notify the plasmid directive that its data is ready to use. Then, the plasmid directive will generate our plasmid. Note: In real world applications, the pattern will be dynamic and will probably arrive from a user or from another service. This article is available on YouTube: https://youtu.be/dPTcdkcrvCY.